Home > Heavy Duty V Belts > Moulded Notch V-Belts. AX, BX, CX, 3VX and 5VX Sections. > AX Series. 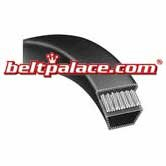 1/2" Wide Molded Notch V-Belts > AX32 Molded Notch V-BELT > A32 Industrial V-Belt. Superior replacement V-Belt. 1/2” Wide, 34” Length. > A33 Bando V-Belt > AX33 Molded Notch V-Belt. AX Series. > 4L350 FHP V-Belt. Consumer Brand. 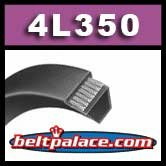 4L350 FHP V-Belt. 1/2” W x 35" Overall Length. Consumer Brand. GATES 4L350 Truflex V Belts. Classical A33 V-Belt on light duty applications.